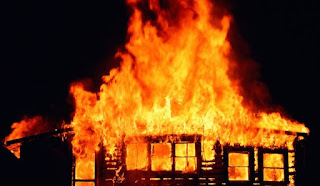 A SUSPECTED Mwenezi illegal fuel dealer accidentally burnt his two -year-old son to death when his hut caught fire from petrol he was pouring into a container near a lit candle. Ivy Chademba of Flora Range Village 4 was burnt to ashes after his father Mr Gift Chademba failed to rescue him from the flames. Mr Chademba escaped with his wife. Masvingo police spokesperson Inspector Charity Mazula said the incident occurred on Sunday at around 8 PM. She said the boy’s remains were taken to Neshuro District Hospital for post-mortem. “I have received a report of sudden death involving a two-year-old Mwenezi boy in an inferno. The father who we suspect is an illegal fuel dealer was pouring petrol from one container into another next to a naked flame of a candle,” said Insp Mazula. “The two parents rescued themselves while leaving their son at the mercy of the inferno and he was burnt to ashes. The whole thatched bedroom hut was engulfed in fire and all the property inside was destroyed,” she said. She said only licensed dealers are allowed to deal in fuel, from safe storages, far from the reach of children.